Dallas Sky Chef Workers are WINNING! Dallas Sky Chef Workers are winning the fight for air conditioning in the trucks! LSG Sky Chefs drivers across the country have been working in trucks without air-conditioning for years. At Dallas-Fort Worth Airport (DFW), some workers have even passed out on the job while working in extreme heat. Last summer, Sky Chefs workers at kitchens all over the country campaigned for safe working conditions on the ramp – including air-conditioning in their vehicles. The national fight is ongoing, but the workers at DFW have won an important victory from Sky Chefs. Starting last summer, the committee at DFW took a survey of over 140 of their fellow drivers. The survey collected data about how the heat was impacting them on the job. 77% of the workers who filled out the survey at DFW said that they had felt dizzy or sick because of the heat while working. 80% said they had felt unsafe while driving LSG Sky Chefs vehicles because of the heat. Sky Chef workers from DFW took the report with the results from the survey to Dallas City Council members. When the politicians met with them they were shocked to hear that they did not have air-conditioning and pledged their support. After the meetings, six members of the Dallas City Council signed a letter to American Airlines, asking them to require LSG Sky Chefs to put air-conditioning in the trucks. Then, the committee took their fight to American Airlines! Samuel Tandankwa led a group of his coworkers in a delegation to the American Airlines headquarters to deliver the letter from the city council members. The fight still wasn’t over. In October, the AFL-CIO leafleted passengers at DFW Airport. The online activist group Sum of Us started a petition to Lufthansa, the owner of LSG Sky Chefs, and the petition got over 100,000 signatures from all over the world. 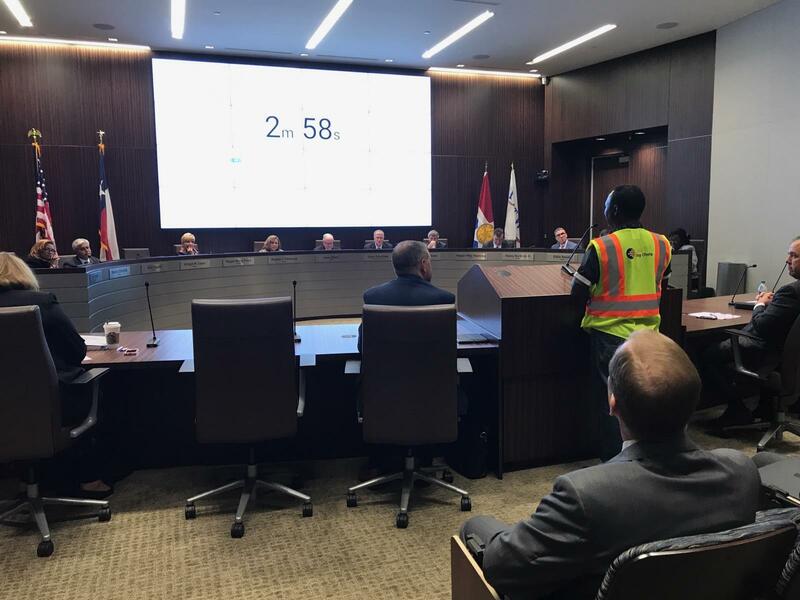 In December, Samuel Tandankwa and Mark York went back to the DFW Airport Board and testified again. Now, after a long fight Dallas workers won a huge victory! Twenty-one new trucks with air-conditioning have arrived at LSG Sky Chefs at DFW Airport! Sky Chefs has promised that new trucks will now come with air-conditioning and they will phase out the old trucks that don’t have air-conditioning. The union leadership committee had a smart plan, they organized their coworkers, they made allies and they didn’t give up! Most importantly, they took their fight straight to the airlines. This is the first step towards winning air-conditioning in trucks for all LSG Sky Chefs drivers who are exposed to unsafe heat. Local 23 members in Charlotte and DC are also fighting for air-conditioning. Get involved in your union to make your job safer. When we fight – WE WIN! /wp-content/uploads/local23logo.png 0 0 admin /wp-content/uploads/local23logo.png admin2018-04-26 10:14:252018-04-26 10:14:25Dallas Sky Chef Workers are WINNING! 2017 Q3 Newsletter United Airline Catering Campaign is in Full Swing!